The Syriac Orthodox Patriarchate of Antioch and All the East confirms that His Eminence Archbishop Mor Severius Malke Mourad is the Patriarchal Vicar in Jerusalem, Jordan and the Holy Land, since 1996 and continues to hold this position till date. He enjoys all the rights given by the constitution of the Syriac Orthodox Church to the archbishop patriarchal vicar. In addition, he is the president of the patriarchal committee administering the endowments of St. Mark Patriarchal Monastery in Jerusalem and all properties of the Syriac Orthodox Patriarchate in the Holy Land. Therefore, the Syriac Orthodox Patriarchate denies all rumors and news claiming that His Eminence Mor Severius Malke Mourad was dismissed from his position, or that the Patriarchate has removed from him any Church authority (immunity), whether spiritual or administrative. 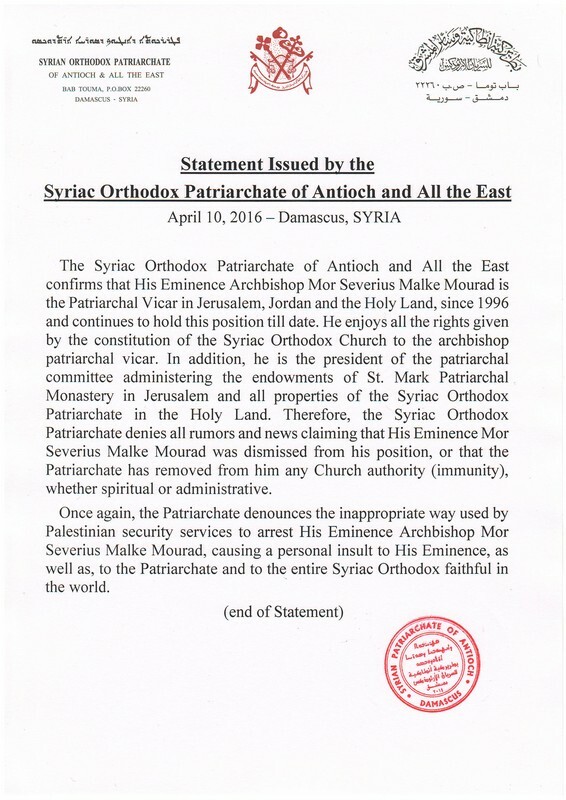 Once again, the Patriarchate denounces the inappropriate way used by Palestinian security services to arrest His Eminence Archbishop Mor Severius Malke Mourad, causing a personal insult to His Eminence, as well as, to the Patriarchate and to the entire Syriac Orthodox faithful in the world.